So ages ago, before I understood that the Ten on Tuesday thing was generated by someone else, I started this list of “10 Places I Want to Go Back To. ” But I’d already started it, so I decided to finish it today…and share it with you, even though we’ve already had an awesome Ten on Tuesday post today. 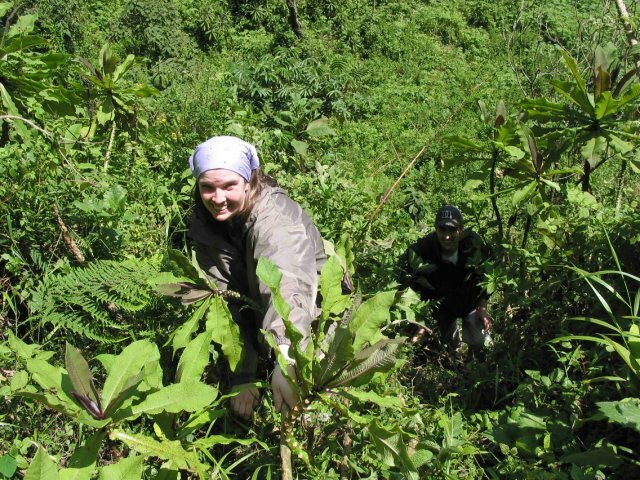 Me on a gorilla trek in the Virunga Mountains of Rwanda in 2005. This is one of the most athletic looking pictures that exists of me! Clearly, I’ve not traveled outside the USA as much as you have, but there are several places that I would go back to, but only AFTER I’ve been a lot of other places first. Of course, at the head of my re-run list is now Alaska (I know that’s USA, but), it was truly my trip of a lifetime! I, too, loved Germany and Austria and would go there again as well. And, both Vancouver and Victoria, B.C. (the “drive-through” on the Alaskan tour bus was just not enough). Also, cruising the Caribbean is gorgeous and restful. My favorite domestic destinations over the years have been (1) the Oregon coast, (2) SanFrancisco, New York City, Chicago — never tire of those; (3) Monterey, CA. ; (4) several scenic areas in Arizona as the desert has a unique beauty, which, as an upstate New Yorker, I really enjoy; (5) the Cape Cod area, (6) Cape May, NJ; (7) Pensacola, FL. ; (8) beaches in general 😊. Etc etc. Really, I don’t think I’ve ever been to a place I didn’t like because I’ve been blessed with hosts/hostesses who have always showcased the very best parts of their areas.